There are a myriad of ways in which a great amount of water can invade your home. When we think of flooding, we imagine a monster hurricane sweeping through town or simply a torrential rain that seems to go on forever. But an equally large amount of invading water can come from something as ordinary as a leaking pipe under your house or a dripping air conditioning unit’s damaged condenser—and left undetected, the damage can be nearly as bad as in the aftermath of a hurricane. Whatever the cause, excess water in your home or office must be dealt with—immediately. Besides monsoons, hurricanes and prolonged heavy rainfall, there are other ways for excess water to find its way into your property and wreak havoc. Did you know that during a full wash cycle a standard washing machine can use at least 40-50 gallons of water? Just think of what might happen if the drain is massively plugged or the hose becomes cracked or jars loose. Yes, you guessed it: that 40-50 gallons of water will back up, having nowhere else to go but all over your home! In fact, that amount of water can create a half inch deep puddle that will cover an area more than 160 square feet. If that isn’t scary enough, if your basic hot water heater’s relief valve were to fail, the heater would empty its contents covering more than 250 square feet of floor space. But that’s not all! Don’t forget about the other hidden hazards like other clogged drains and overflowing sinks and toilets. The worst thing about the latter is that these leaks can occur over an extended period of time possibly causing even more damage than a strong storm. Often these sort of leaks happen, unseen, under flooring and behind walls. Back to damage from rain. What if you have some damage to your roof that you didn’t know about? Water damage will happen after a few rain showers or even a broken fire hydrant nearby, causing a continuous leak. Also, if you have poorly installed siding or windows a rain storm of any strength can send water into your home. Plus, your home won’t stay new forever; as the structure ages those windows can warp and your roof can develop breaches. 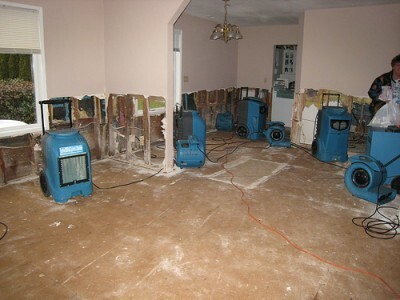 If the damage is due to a flood, no matter the size, the most affected areas of your home will be the flooring. Any type of leak can fan out across your floors, soaking into whatever surface it sinks into. Wood naturally retains water and can absorb quite a bit without suffering any adverse effects. However, if water remains on wood floors for too long those wood floors won’t be able to absorb any more liquid before the boards begin to buckle and crown. This will ultimately cause permanent damage. If you have carpeting soaked by a lot of water you’ll have to decide whether to attempt to salvage the carpeting through drying and dehumidification or by replacing the carpeting altogether. Orange Restoration can assess the damage and offer cost-effective recommendations so that you won’t have to waste time or resources. No one likes to think that they’ll have to deal with water damage, but despite this, you really should be prepared in case you’re faced with this problem. Handling a bad situation quickly will mean the difference between being able to save most of your possessions or calling it a total loss. If water is allowed to sit for too long it can cause further damage to items and structural materials. These delays in action will drive up the cost of repairs—and replacement of materials and possessions will only add to the overall cost of dealing with the resulting damage. Orange Restoration is available 24 hours a day, every day, regardless of the extent of the damage: large or small, we consider taking care of any water damage our highest priority. We will fully inspect the damage to your property and develop a game plan to fix the damage—and that includes testing for mold growth and the resulting remediation. Cleaning your basement after flooding is a 5-step process Is Water Damage Covered Under your Insurance Policy?